The United States recently went through the hottest 12 months ever, since record-keeping began in 1895. National Oceanic and Atmosphere Administration said that for the period from May 2011 to April 2012, the nationally averaged temperature was 55.7 degrees, 2.8 degrees higher than the 20th century average. 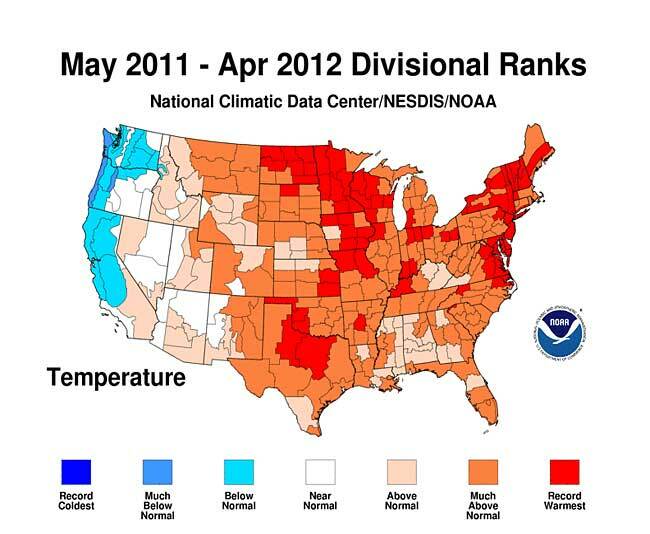 The national average temperature for April was 55 degrees, 3.6 degrees above average. To be sure, the higher temperatures haven’t hit every region equally. The Pacific Northwest actually saw cooler-than-average temperatures over the past year, according to NOAA data. Much of California was also cooler than normal; Southern California had an average year. But record averages for the year scorched central Texas — which saw a horrific drought last year — the upper Midwest, and much of the Northeast. The last time the globe had a month that averaged below its 20th century normal was February 1985. April makes it 326 months in a row. Nearly half the population of the world has never seen a month that was cooler than normal, according to United Nations data.